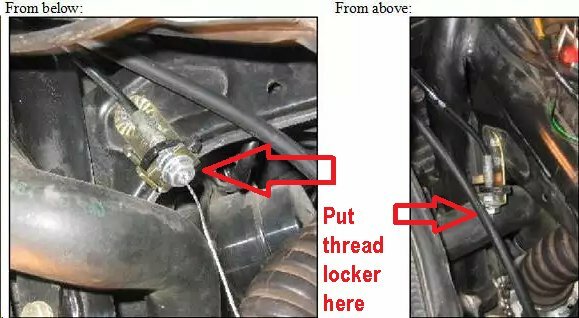 A Technical Service Bulletin on how to keep your cruise control from jacking the idle up to 3,000 RPM. After pulling over at a gas station, removing the battery covers and seat to pull the tank back so I could get to the throttle cable connection, I discovered that the lower nut on the cable from the cruise control servo had vibrated loose and fallen down the cable. This allowed the cruise control cable to creep up and keep the throttle slightly open. It doesn't take much throttle for a bike in neutral to get up to 3000 RPM. The following applies if you are using the two nuts at the end of the servo cable to adjust/secure it.